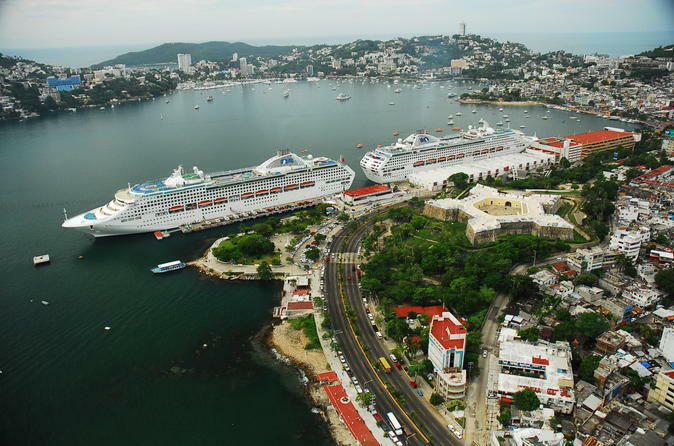 This is a sightseeing tour that includes the overview to the three important areas of Acapulco. See The Traditional Zone with famous La Quebrada; The Golden Zone surrounding one of the most beautiful bays in the world and the not less important Diamond Zone, connected by the outrageous Scenic Highway. It is home to exclusive hotels, residential complexes, luxury condominiums and private villages. Stops at La Quebrada, a silver shop, a view point for pictures at the Scenic Highway and Princess Hotel are included. Departure is daily and based on the cruise ship call. Be ready outside the Cruise Ship Terminal at Parque de la Reyna to meet your guide who will be carrying "Your Name" sign. Board your vehicle and begin a trip that will give you a full overview of the city. Escorted by a professional tour guide, begin the sightseeing with a ride towards the oldest area of the city, pass by the Fort of San Diego Museum, the Main Square (Zócalo) and the Peninsula and meet the Traditional Zone which was developed between 1930's & 60's and its house of historic neighborhoods and the world famous La Quebrada where you will have the opportunity to enjoy the amazing cliff divers show, you can also visit a silver shop nearby. Admission fee to the show is not included. The tour continues along the main street, Costera Miguel Aleman, to drive through the Golden Zone and get a glimpse of the Touristic Acapulco. "La Costera", as everyone knows it, was inaugurated on February 1949 and named after Ex-President Miguel Alemán Valdes. Following that ride you will continue on the Scenic Highway from where you will admire beautiful views to Santa Lucia Bay and Puerto Marques Bay, the huge cliffs that form the mountains that surrounds the bay allow wonderful view points to take pictures. After driving along the Scenic Highway, you will be right at the new Diamond Area to witness the new development and investment in Acapulco. In the area you will find Revolcadero Beach, a big shopping mall La Isla, the new convention center with a large concert forum Mundo Imperial, four golf courses, a three time bigger than the bay lagoon and much more. A quick stop will be made at the traditional Princess Mundo Imperial Hotel. Soon after you will start your ride back to the Cruise Ship Terminal, to board your ship and enjoy your afternoon. The order of the visits to sites will be based on the time of call of your cruise ship, itinerary might be modify or changed always on your best interest.